During the Samuel Pepys: Plague, Fire and Revolution exhibition at the National Maritime Museum. The choir Reverie, artistic director Robbie Jacobs, composer Freya Waley-Cohen and poet Caleb Klaces are presenting a new immersive installation, The Glass and Rope Between Us – Pepys visits Pepys. Using the medium of song to represent the thoughts of Samuel Pepys the installation asks the question How would Samuel Pepys respond to seeing the details of his life and diary displayed in public for all to see? On 27 February, ten singers will be in the exhibition singing new music which responds to the content of the gallery. 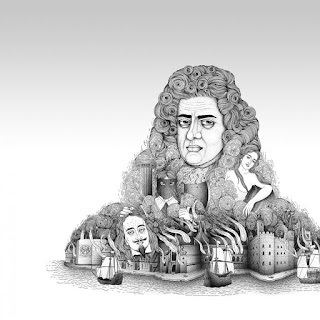 The work intends to ask questions like, 'What did Pepys feel as his home was destroyed by fire?' and 'How would the ubiquitously unfaithful Pepys respond to the portrait of his wife Elizabeth?'. The singers will interact with the audience as they explore the gallery, sometimes taking them by surprise, and revealing some of the unexpected aspects of Pepys’ character from the funny to the crude. Primary school children from the area will visit the exhibition to learn about Samuel Pepys, and then through workshops with Reverie’s practitioners, the children will write poems and songs based on the gallery content. These will be performed in the Samuel Ofer Wing at 16:30 on Friday 26 February. Full information from Reverie's website.